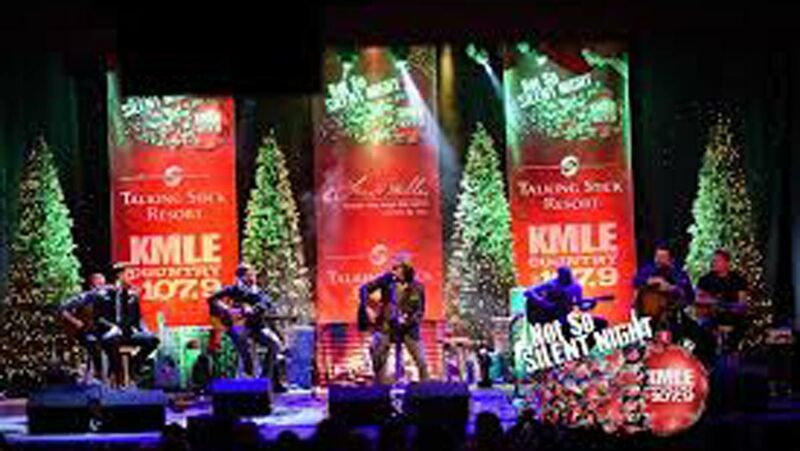 Earnhardt Auto Centers presents KMLE’s “Not So Silent Night.” This event will take place on Tuesday, December 4th, at 6 p.m. at the Talking Stick Resort in Scottsdale. Check out the great lineup and listen to KMLE to win your way into the show! This holiday-themed event showcases top country talent, including Kane Brown, Granger Smith, Carly Pearce, Brandon Lay, Tyler Rich, Riley Green, and Austin Burke. KMLE is hosting a contest, the “Not So Silent Night Tag,” and the lucky grand prize winner receives the Ultimate Experience. It includes a pair of front-row tickets to the show along with a one-night stay at Talking Stick Resort. The winner also receives dinner for two at the resort, passes to the KMLE VIP pre-party and after-party, and an acoustic guitar signed by all of the Not So Silent Night artists! To win Earnhardt Auto Centers and KMLE’s Not So Silent Night Ticket Tag, listen to KMLE weekdays through November 30. The first caller during the 7 a.m. hour automatically wins a pair of tickets. The next caller, at 9 a.m. and at other specified hours, must know the previous winner’s first name and city to “tag” into the contest and win show tickets. All qualifiers will be entered to win the Ultimate Experience. The Ticket Tag resets each day! You can also enter online for a chance to win a pair of front-row tickets to KMLE’s Not So Silent Night. KMLE will call the lucky winners! All entrants, online or call-in, must be at least 21 years old. Don’t miss your chance to win tickets to this great show! Earnhardt Auto Centers is a proud title sponsor of this event. Earnhardt dealerships represent 17 brands in 21 locations in the Valley, northern Arizona, and Las Vegas. Founder Tex Earnhardt still leads the company with his “No Bull” approach. When you’re in the market for sales or service of a new or used vehicle, check out Earnhardt Auto Centers. You won’t be disappointed!